Have you ever wondered what's really hiding in the closet at night? Click here to play! Now's your chance to find out. You're going on a monster hunt and you'll need to capture these crazy critters for a chance to bring in plenty of big money! With the moon high in the sky, the monsters start to come out and though you'll have all sorts of creatures emerging in the darkness, you'll want to keep a close eye out for the WILD monster. This little yellow guy is a substitute and will replace most other symbols to help you create more wins. 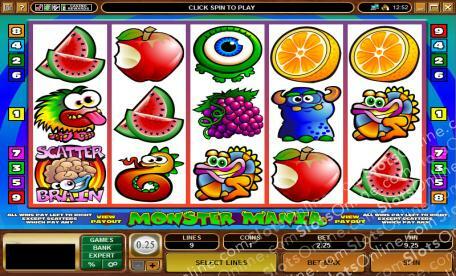 You'll also want to capture monster's of the hairy variety on these wheels as the green hairy monster will pay out up to 1000 times your line bet if you can spin him two to five times across an active pay line. There are blue, striped, cyclopes and serpent monsters as well, so be sure to grab a variety in order to keep the money rolling in. You might run into a surprise or two while you're searching the night for monsters, particularly if you spin the brain scatter. This symbol will blow your mind as it will multiply your total bet if you can spin three or more anywhere on the board Spin these reels and get ready to grab some mysterious creatures for a chance to win a small fortune! The brain symbol acts as a scatter. This grey matter will multiply your total bet if you can spin three to five of them anywhere on the board. The WILD monster acts as a substitute and will replace all other symbols (excluding scatters) to help you spin in more wins.